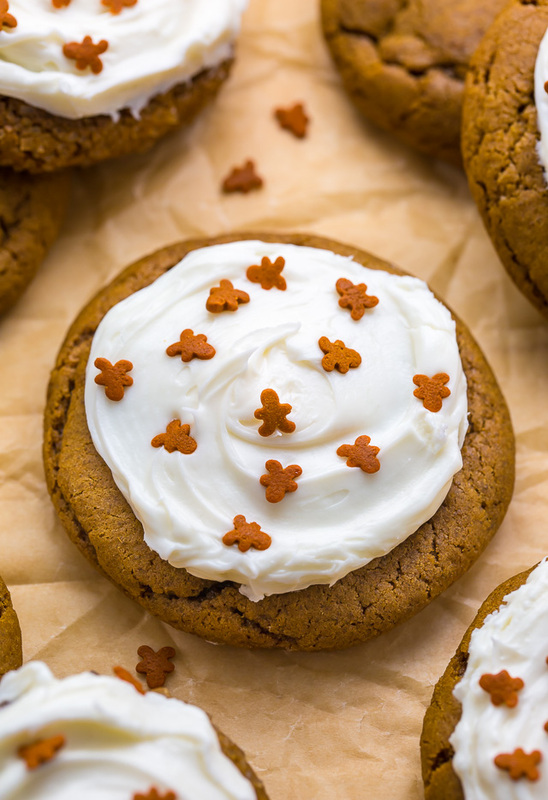 Frosted Gingerbread Cookies are fun to make and SO delicious! Holiday baking is in full swing and I have SO many treats to share with you before I head home for Christmas break. Have you started your holiday baking? Are you traveling anywhere for the holidays? I’m an enormous fan of ginger, so I’ve been steadfast in baking as many gingerbread recipes as possible this season. So far we’ve made chewy chocolate gingerbread cookies, gingerbread latte cupcakes, brown butter gingerbread men, and now, frosted gingerbread cookies. Spoiler alert: I also have a gingerbread cake coming for you next week! You can find the super cute gingerbread sprinkles you see in my photos here. The dough must chill for at least two hours! If you skip this step, your cookies will bake up flatter than a pancake. The good news? The dough can be chilled for up to 24 hours, so you can make it ahead of time. Be sure not to over bake the cookies. They need 9 to 10 minutes, maximum. They should be set at the edges and look slightly under baked in the center. They’ll firm up quite a bit as they cool. Be sure your cookies are completely cooled before frosting. 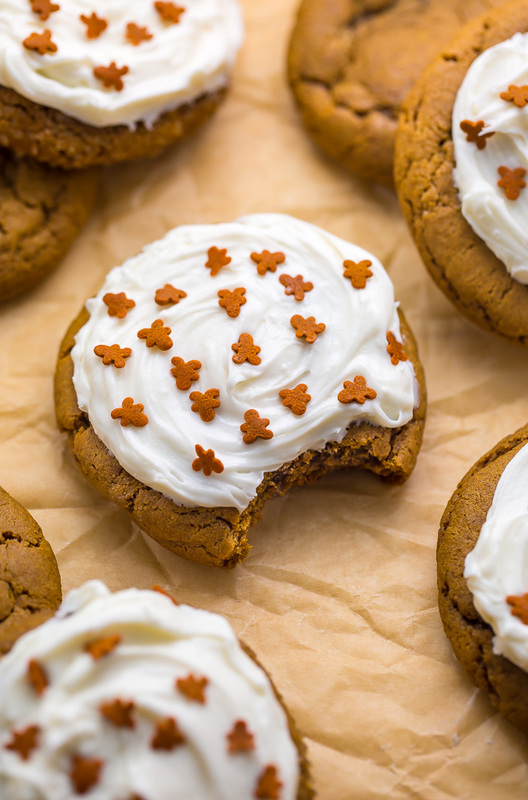 These gingerbread cookies are so delicious they can be left unfrosted… but why would you want to?! 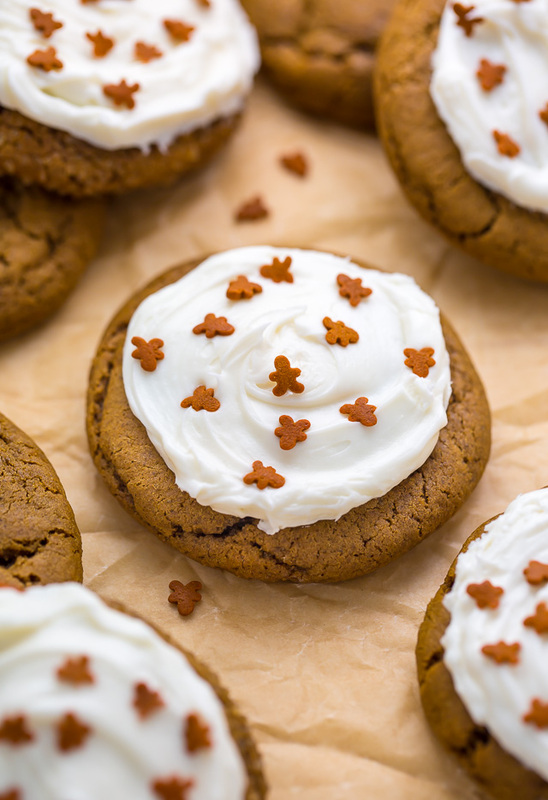 So go on, spoil yourself with a batch of these frosted gingerbread cookies! Serve them with good coffee or tea and ENJOY. 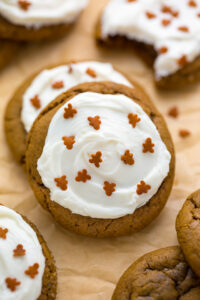 If you try these Frosted Gingerbread Cookies, let me know what you think! 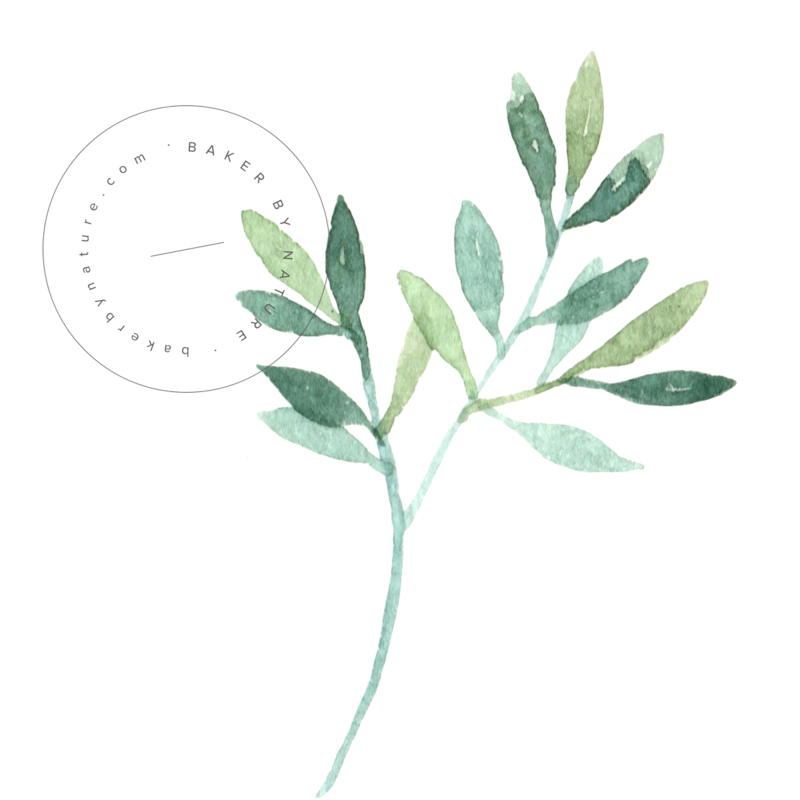 Leave a comment below, and don’t forget to snap a pic and tag it #bakerbynature on instagram! Seeing your creations makes my day. Frosted Gingerbread Cookies are soft, chewy, and so delicious! In a large bowl whisk together the flour, ginger, cinnamon, cloves, baking soda, and salt; set aside. Add butter, both sugars, and vanilla to the bowl of a stand mixer fitted with the paddle attachment; beat on medium-speed until light and fluffy; scraping down the sides of the bowl as needed, about 2 minutes. Add in the eggs, one at a time, beating well after each addition, continuing to scrape the sides as needed. Add the molasses and beat until combined. Reduce the mixer speed to low and slowly add dry ingredients, beating just until combined. Cover bowl with plastic wrap and transfer to the refrigerator to chill for at least two hours (or up to one day). Preheat oven to 350 degrees (F). Line two large baking sheets with parchment paper; set aside. Roll the dough into 2" balls and arrange on prepared sheets, spacing them about 2 inches apart. Lightly press down on the center of each cookie. Bake, one sheet at a time, for 9-10 minutes, or until puffed and lightly golden. Remove pan from oven and allow cookies to cool on the baking sheet for 5 minutes before transferring them to a wire rack to cool completely. Repeat with all cookie dough. Once cool, frost with cream cheese frosting, top with sprinkles (if using), and serve. In the bowl of a stand-mixer fitted with the paddle attachment beat the cream cheese, butter, and vanilla on medium-high speed until completely smooth; about 2 minutes. Reduce the speed to low and gradually add the sifted confectioners' sugar. Once all of the sugar has been added, increase speed to medium-high and beat for 1-2 minutes. Add in lemon juice and lemon zest and beat for an additional minute. Once the cookies have completely cooled, spread the frosting over the top of each cookie and decorate with sprinkles, if desired. I love the gingerbread sprinkles on top, they are such a cute addition! I need to make a batch! This cookies is so lovely, amazing decoration! i wish i had seen this before christmas 🙁 maybe next year! This is the second time I make these cookies, I don’t do the frosting only cause my toddler eats them and I’m trying to avoid excess sugar. But with or without the frosting these are delicious and super easy to make! Thank you so much, I love your recipes! I’ve used a few so far and whatever I make turns out awesome. Hi Samara! 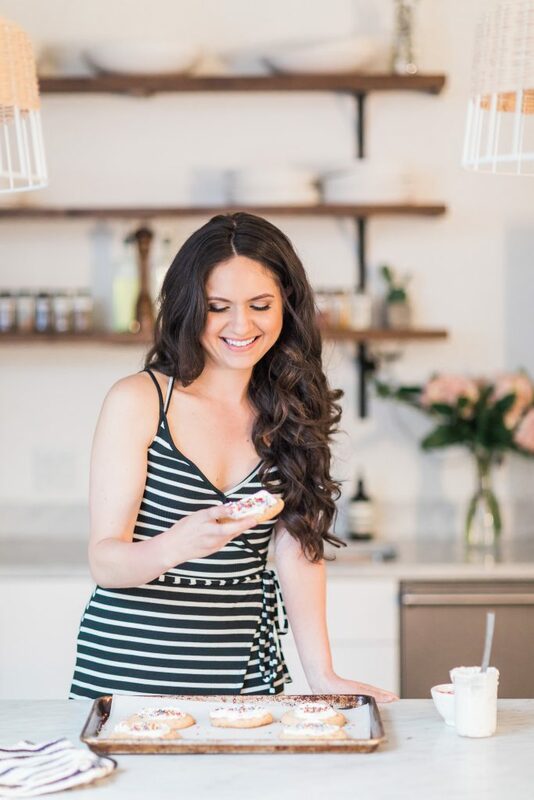 I’m so happy you and your toddler are enjoying this recipe 🙂 Happy baking! I made these cookies last Christmas and everyone loved them! 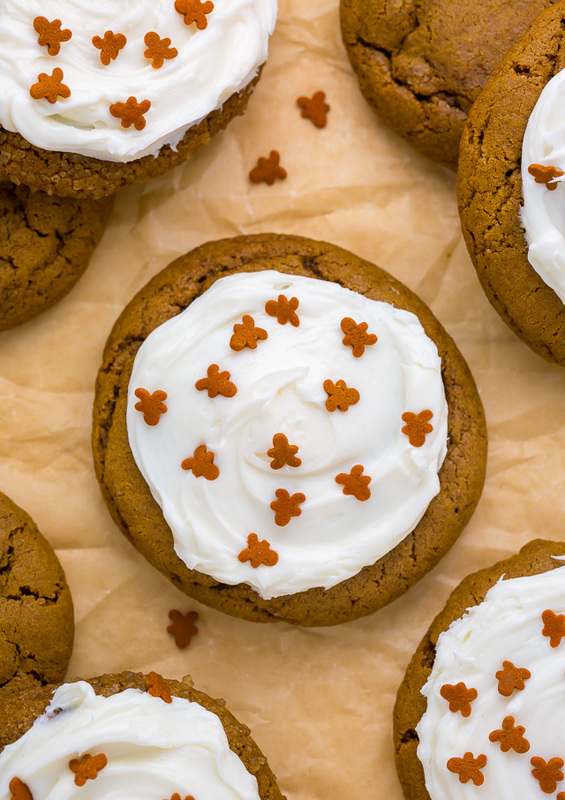 The lemon cream cheese frosting is the perfect compliment to the ginger! Can’t wait to make them again this year! These look delicious. I’m wondering where you got the cute gingerbread men sprinkles. Is there a link? I made these twice last week and they are incredible! They were such a hit the first time that I made them again for another event a few days later.